The parents took Mady and Lauren to Busch Gardens today. Why didn’t I go? I’ve been there, it costs $75 to get in and it’s not very relaxing, that’s why. I hit the beach by 8 a.m. and after an hour and half, this is what I found. The teeth were harder to find today. The last couple of days the beach has presented huge bars of shells, which is where a lot of the teeth get caught up. With a little raking you can find what I’ve got below in a short amount of time. Today was a different story. The shell bars were mostly gone. What remained was no wider than one foot. So, I had to resort to standing at the water’s edge. I like doing it that way. But it can also make me rather dizzy. And you have to be fast. The ocean gives just as quickly as it takes. You might see the coolest tooth ever and then watch it be taken away just as fast as you saw it. I also found a ton of mouth plates that belonged to stingrays. They are pictured on the left in the photo above. They’re like a little rectangle with slats in it. I like finding those. I also found a nice barb from a stingray, but my kid took off with it. I’m sure it will surface sometime soon. My folks have prehistoric horse teeth, and bones from mastadons as well. I found a big bone this evening, but I don’t know what it’s from. I pick up almost everything that is black. 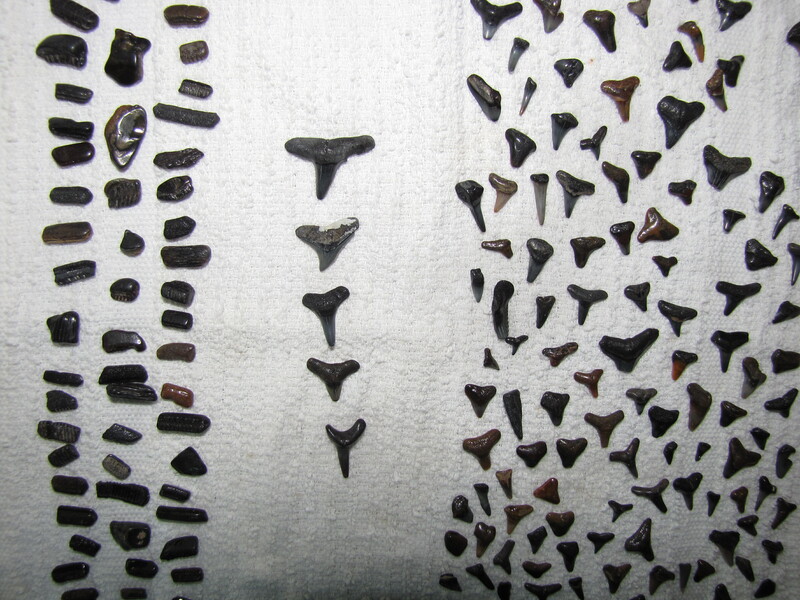 You might find a vertabrae from something, or a drum fish tooth. Both of those items are round. I like the way that the fossils can be different colors. Some are black, some are gray and some are more of a brownish or orange in coloring. It all depends on what color of sand the fossil has spent its lifetime in. This area here has the largest contintental, coastal shelf, so that’s why the fossils are in abundance. I know some people have found teeth in the rivers of the Carolinas as well. But mostly they are found right here, where I’m at, right now! 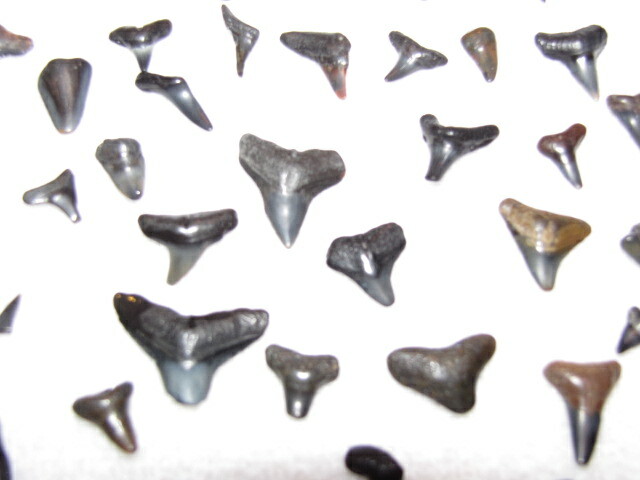 Categories: family, nature, travel | Tags: florida, fossils, shark, teeth | Permalink.